With armed conflict in the Persian Gulf now upon us, Harvard archaeologist Steven LeBlanc takes a long-term view of the nature and roots of war, presenting a controversial thesis: The notion of the "noble savage" living in peace with one another and in harmony with nature is a fantasy. 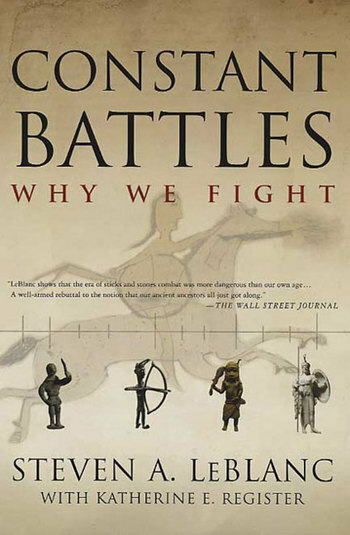 In Constant Battles: The Myth of the Peaceful, Noble Savage, LeBlanc contends that warfare and violent conflict have existed throughout human history, and that humans have never lived in ecological balance with nature. The start of the second major U.S. military action in the Persian Gulf, combined with regular headlines about spiraling environmental destruction, would tempt anyone to conclude that humankind is fast approaching a catastrophic end. But as LeBlanc brilliantly argues, the archaeological record shows that the warfare and ecological destruction we find today fit into patterns of human behavior that have gone on for millions of years. Constant Battles surveys human history in terms of social organization-from hunter gatherers, to tribal agriculturalists, to more complex societies. LeBlanc takes the reader on his own digs around the world -- from New Guinea to the Southwestern U.S. to Turkey -- to show how he has come to discover warfare everywhere at every time. His own fieldwork combined with his archaeological, ethnographic, and historical research, presents a riveting account of how, throughout human history, people always have outgrown the carrying capacity of their environment, which has led to war. Ultimately, though, LeBlanc's point of view is reassuring and optimistic. As he explains the roots of warfare in human history, he also demonstrates that warfare today has far less impact than it did in the past. He also argues that, as awareness of these patterns and the advantages of modern technology increase, so does our ability to avoid war in the future. Steven A. LeBlanc, an archaeologist at Harvard, is the director of collections at the Peabody Museum of Archaeology and Ethnology. He is the author of Prehistoric Warfare in the American Southwest. Katherine E. Register is a writer working in the Boston area.